Liverpool fans can give the team a very real advantage in their remaining five Premier League home games, insists Andy Robertson. 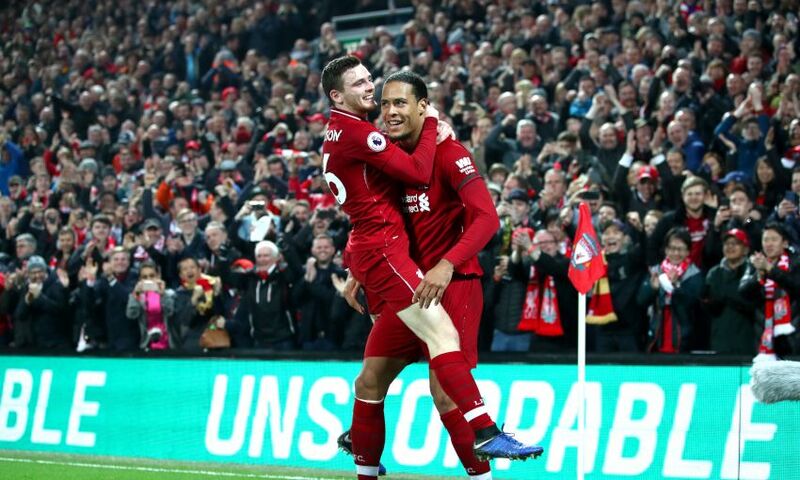 The Reds will host Burnley on Sunday and then face Tottenham Hotspur, Chelsea, Huddersfield Town and Wolverhampton Wanderers at Anfield as they aim to win the title race with Manchester City. Players and supporters alike have highlighted the influence of the atmospheres generated during the emphatic victories over Bournemouth and Watford in the past two home league fixtures. And with three crucial points on offer in a midday kick-off with the Clarets, left-back Robertson opened up on exactly how the crowd can impact the action on the pitch – particularly for daytime encounters. Reflecting on the Bournemouth clash, he told The Anfield Wrap: “After the game, all the lads knew it made a big difference, even from when we were going out to warm up. There were a lot more fans in the ground than usual. “It’s a special atmosphere regardless but when we play against Manchester United or Everton, or in the Champions League, of course it’s a bit easier to create a special atmosphere. “But it’s probably the games on Saturday at three o’clock where we maybe need it the most. We all pulled together in that game. “We’ve only got nine games and half of them will be at home, so if we can create an atmosphere that makes even a small difference to the lads then it will stand us in good stead. “Of course, it’s up to us to respond to that, which we did brilliantly against Bournemouth. It might not always be the case in games for one reason or another. But we responded well to it and it made a difference in that game. I thought the Watford game was really good as well; the early goal obviously helped.